Cambrian life and evolution: First eyes upon Earth - camera obscura? Planet Earth was going through many transformations climate changing, oceans rising and lowering again, land masses moving violently and rocks melting again quietly eroding... In the midst of all this life was surviving as a tiny promise for future patiently building oxygen with the power of Sun. Evidence has shown that in the Ediacaran period there were mats of sessile organisms on the shallow seas and at some point something moved there for the first time. But as far as we know, for very long early period in the early history of life upon Earth nobody had eyes to see nor the brains needed to interpret the significance of the electric signals produced by eyes. Every living thing enjoyed the Sun and used the energy in the photons for their benefit and the benefit of all in one way or other - but nobody had eyes to see. By the English word eye we commonly indicate some kind of organic thing or its mechanical equivalent that lets light in to a small space through an opening, possibly has some sort of lens(es) to focus the incoming photons on a layer acting as photosensitive layer(s) that translate the incoming light beams into some sort of electronic signals that a brain or equivalent can decipher to form a meaningful image of the surroundings. Is that definition of an eye generic enough? If there is no opening, no lens, no photosensitive layer, no brain wired to the thing, we call it something else but not an eye, right? At least laymen like me. Camera obscura is the simplest of eye like devices invented by humans. It is not really an eye because although it does have a pinhole and a dark chamber for the light to enter there is no independent photosensitive surface to detect the light nor anykind of built-in or wired brain to interpret the image generated by light beams without any lens bending them on the way. Nevertheless, camera obscura is an initial rude concept of a device that "can see" and humans are still today busy at work to create increasingly sophisticated cameras that also have sensors for detecting movement, changes in environment and for aiming weapons - of course. It took us with our highly sophisticated brains - by far the smartest upon Earth if we judge from who is the boss among the living things here - quite a long time to evolve the concept of camera obscura. The first surviving mention of the principles behind the pinhole camera, a precursor to the camera obscura, belongs to Mo-Ti (470 BC to 390 BC), a Chinese philosopher and the founder of Mohism. Mo-Ti referred to this camera as a "collecting plate" or "locked treasure room". The Greek philosopher Aristotle (384 to 322 BC) understood the optical principle of the pinhole camera. He viewed the crescent shape of a partially eclipsed sun projected on the ground through the holes in a sieve, and the gaps between leaves of a plane tree. The camera obscura was known to earlier scholars since the time of Mozi and Aristotle. 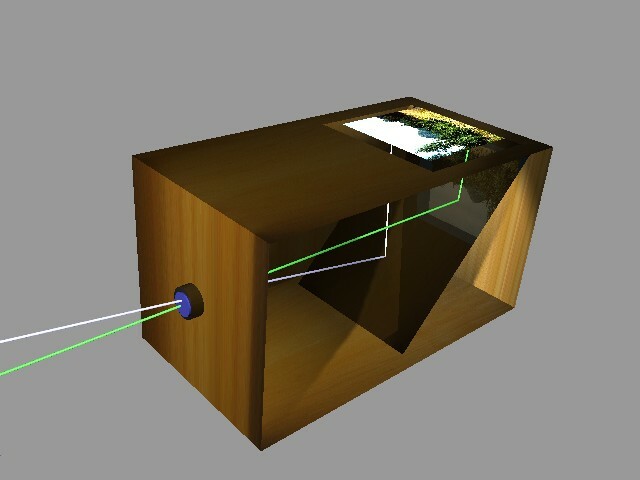 Euclid's Optics (ca 300 BC), presupposed the camera obscura as a demonstration that light travels in straight lines. Early models were large; comprising either a whole darkened room or a tent (as employed by Johannes Kepler). By the 18th century, following developments by Robert Boyle and Robert Hooke, more easily portable models became available. These were extensively used by amateur artists while on their travels, but they were also employed by professionals, including Paul Sandby, Canaletto and Joshua Reynolds, whose camera (disguised as a book) is now in the Science Museum (London). Such cameras were later adapted by Joseph Nicephore Niepce, Louis Daguerre and William Fox Talbot for creating the first photographs. So if our species we call human has existed on this planet for about five million years (counting from the DNA based estimation of the time we separated from the chimpanzee) it took us about five million years to evolve the idea of a pinhole camera. Not by everyone by the very smart people of ancient China and Greece. It obviously took lots of brainpower to figure it out and to build a pinhole camera. five million years since we 'separated' from the chimp line..haha..I don't think so..btw,did we have 'eyes' then?